Enjoy the flexibility and convenience of SeaWorld Signature Show Seating. This is your ticket to one-time reserved seating for the most popular shows at SeaWorld Orlando. Shamu Stadium for One Ocean®, the sensational Shamu® show, showcasing SeaWorld’s entire family of majestic killer whales. 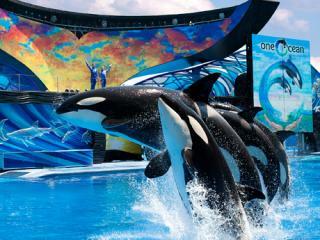 The show features spectacular whale behaviours, including thrilling high-energy leaps and multiple killer whales performing simultaneously. Seaport Theatre for Pets Ahoy featuring a cast of unlikely characters that will have the whole family laughing from beginning to end. Dogs and cats, ducks and doves, potbellied pigs and a few surprise animal guest stars will show you just what SeaWorld Orlando’s encouragement-based training techniques can accomplish. Dolphin Theater. The whole family will be entertained and inspired by the festive celebration of Dolphin Days, starring the ocean’s most playful ambassador, the Atlantic Bottlenose Dolphin. Enjoy an up-close look at the relationships the majestic animals have with their trainers whilst learning about dolphins and their importance to our natural world. Sea Lion & Otter Stadium. Clyde & Seamore’s Sea Lion High is a sea lion comedy adventure full of fun and big personalities from sea lions, walruses and otters! The cast of amazing animals and trainers connect guests with these incredible animals in a way that only SeaWorld can! SeaWorld Signature Show Seating ticket price is in addition to park admission, a separate entrance ticket to SeaWorld will still be required. Park admission is not included and is required. The SeaWorld Signature Show Seating Ticket must be booked in advance and you must select your chosen date at the time of booking. You will receive a SeaWorld Signature Show Seating Ticket e-ticket. This ticket is only valid for the date chosen at the time of booking and cannot be used on any other day. The SeaWorld Signature Show Seating Ticket allows a one time reserved show seating for Shamu Stadium (One Ocean), Seaport Theatre (Pets Ahoy) and Sea Lion & Otter Stadium (Clyde & Seamore’s Sea Lion High). Attractions subject to availability and shutdown due to weather. Check the daily show schedule for show times.